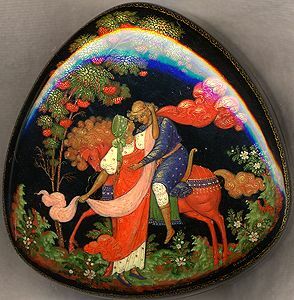 This splendid Palekh box has been painted by Olga Kolygina. The work is called "Parting", and shows the parting of a maiden with a brave warrior who is going to defend his motherland from an enemy. A simple palette of blue, red, brown and green paint is used to characterize this dramatic moment. Tragedy is conveyed through the painting of the body language of the characters. Good detailing with gold paint gives the trees and the landscape texture, while it also reveals the contours in the characters' bodies. The box is constructed out of paper-mache. Black lacquer covers the exterior and red lacquer covers the interior of the piece. The exterior is decorated with intricate and precise, gold ornaments. The box has no hinge and rests on three legs. The box is signed with the artist's name, Palekh, the title and the year of 2005.